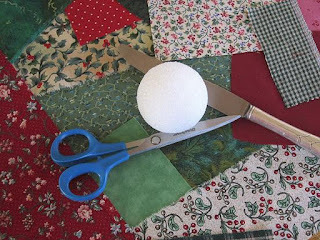 I love these styrofoam patchwork Christmas ornaments. I thought I understood the basic design strategy. 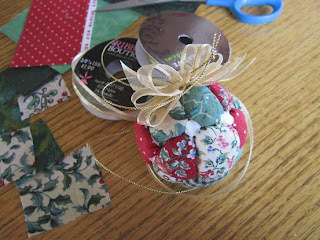 You clearly push the edges of small fabric patches into a styrofoam ball, make a ribbon bow for the top and hang it on the tree. But I’ve tried to make this ornament so many times in the past and always tossed my pitiful attempts in the trash. I’ve never been able to identify what I’m doing wrong. But I keep trying and this is my latest effort. 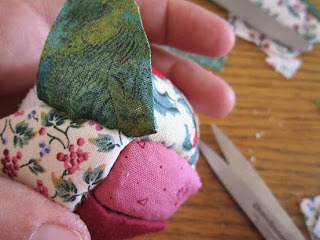 I'm sharing a basic tutorial, plus what I’ve learned about this ornament. 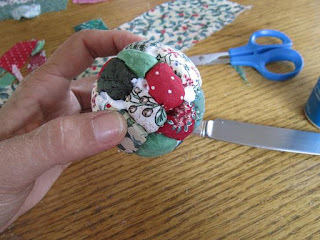 This will make more sense if you actually try to make the ornament.You’ll need very simple materials and tools: a 2.5-inch or 3-inch styrofoam ball, scraps of Christmas fabric, scissors, and a thin table knife or fingernail file. The knife tool needs to be very thin so that you don’t make too wide of a space in the styrofoam. You might want one or two extra balls and some scraps of fabric to practice on! You may also need some clear-drying glue. 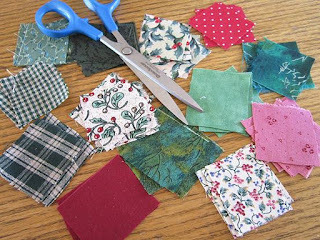 Cut the fabric into small squares about 1-inch or 1.5-inches in size. Include a variety of colors. The visual contrast between different fabrics seems to help emphasize the puffy edges. Begin with two patches with right sides together. 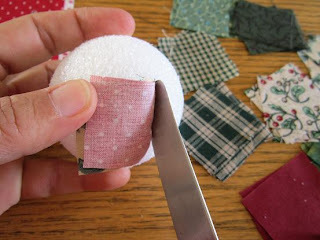 Push the edges on one side of the patches into the styrofoam. Try to push the edges of the fabric straight down. Then, open them up and gently smooth the patches. Continue to add patches this same way. You’ll find that, even though you cut the fabric the same size, your patches don’t always come out even on the ball. I can’t explain this, except that this styrofoam process is way more variable than sewing the fabric! Just keep adding patches. Some will come out square and some will only loosely resemble square. 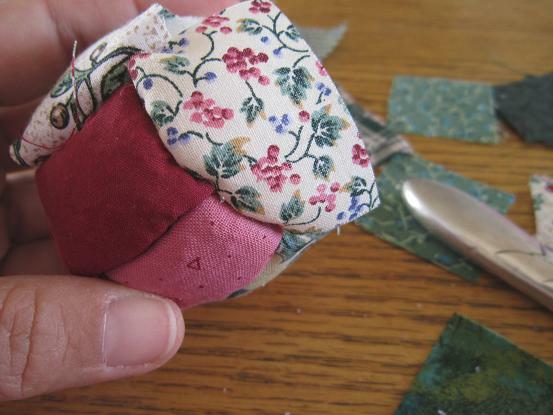 As you come up around the curve, some of the “squares” will need to be more triangular in shape, and you may need to start over, once or twice. But if you redo more than once or twice, the space in the styrofoam becomes too wide, and the fabric won’t stay in the space. If the ball gets too ragged, you may need to begin with a new ball. 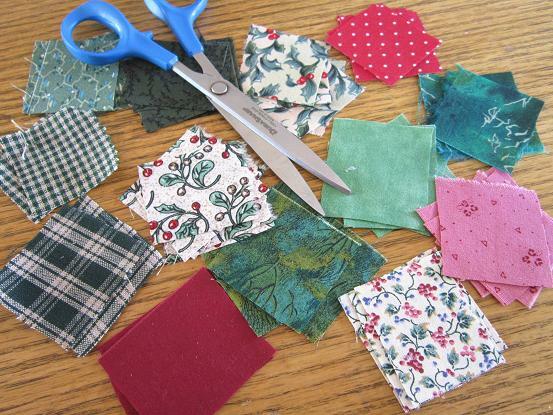 You will need to trim excess fabric on some patches to fit the space between two other patches. Just be careful to leave enough fabric to turn a nice edge. Turning the corner is the most difficult part of creating this ornament. This difficulty has always defeated me in the past. 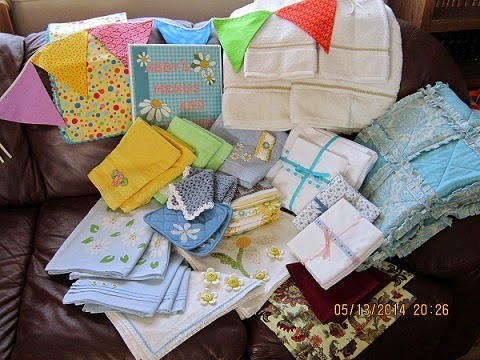 There is a lot of fabric in the corner and nowhere for it to go. You can try trimming a little off, but be careful of trimming too much, because it may pull out a few minutes later when you push in the other side of the patch. Then the styrofoam is showing and there is no fabric to fix the problem. You can also try tucking some under, which works sometimes, but not always. 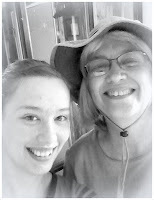 It seems that no matter how careful I am, I always have both edges and corners that pull up or are loose. This year, rather than throwing the ornament away, I decided to simply use a bit of clear-drying glue (Elmer's or Alene's) to keep things where they are supposed to be. I added a tiny bit to some edges that were ragged and put some in the corners that just wouldn’t stay put. I added the ribbon bow to the top of the ornament and a gold thread hanger. Then I let the whole thing dry overnight, hoping that the glue would truly dry clear. Thankfully, it did. Now that I’ve finally had one sucessful attempt, I may try to do a few more. 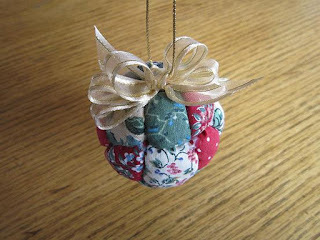 If anyone knows anything more about the process to make this ornament, I hope you’ll leave a comment. Thanks! I think it turned out beautifully! I did something similar for a wall hanging, so it was flat and square, but it had the lines in the styrofoam pre-cut with an exacto knife. Another one had a thin layer of squishy craft foam (very technical terms, I know) glued to the top of the styrofoam, and I really liked the effect of that, again, the lines were pre-cut. I don't know how well it would work on a ball, but thought I would mention it. Thank you soooo much for your suggestion. 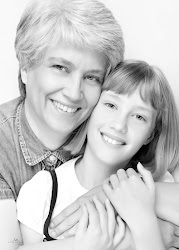 Your designs are beautiful and expertly created! 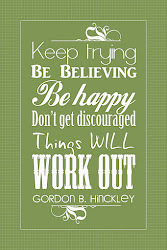 I'll keep trying. I wonder if you cut the styrofoam with a knife or do you use some other tool.